The banking giant did not specify the number of customers that were affected by the outage. The banking giant becomes the first in the UK to block transactions after the digital currency's dramatic fall in value since December. The bank has a major shake-up planned for borrowing charges starting in November. 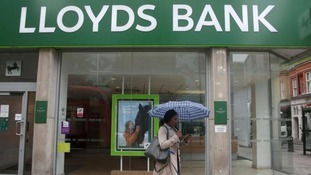 Lloyds Banking Group has been fully returned to private hands nearly nine years after being bailed out during the financial crisis. Taxpayers have recovered all of the £20.3 billion bailout injected into Lloyds to prevent it from collapsing during the financial crisis. All proceeds from the sale of shares are used to reduce the national debt. The extra funds are to cover payment protection insurance claims, the bank said. The latest share reduction is hailed a 'milestone', nine years after a £20.3bn bailout bought taxpayers a 43% stake in the crisis-hit bank. Lloyds Banking Group is cutting 3,000 jobs and shutting 200 branches as the lender braces for a cut in interest rates, it has announced.